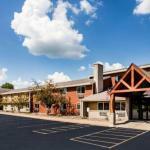 Free Wi-Fi and hot breakfast year-round swimming and nearby shopping cultural events and I-94 lead the list of amenities at the AmericInn - Menomonie. The two-story hotel's 55 rooms featuring free Wi-Fi cable TV coffeemakers hairdryers and irons. Non-smoking rooms are available. A rotating menu of waffles hashbrowns bagels and more are featured daily on the complimentary breakfast spread. Enjoy year-round access to the indoor pool and hot tub. There's also a business center and fitness room on-site. Pets are welcome for an additional fee. Parking is free The hotel is off I-94 within one mile of Wakanda Park on Lake Menomin. A five-minute drive south leads to Mabel Tainter Memorial Theatre at the University of Wisconsin - Stout. Shopping is less than one mile away at the Shops Off Broadway. A 25-mile drive east leads to Chippewa Valley Regional Airport.